The tradition of children receiving gifts during the month of December is relatively the same no matter where you go in the world, but the character that brings the gifts can vary quite a bit from country to country. It is true that the American version of Santa is rapidly catching on abroad, but in addition to Mr. Claus many countries still celebrate their own unique Christmas characters. From rascally gnomes and friendly witches to creepy goat creatures, the following are the top ten Santa legends from around the world. You may also be interested in the Top 10 Bizarre Christmas Traditions. The Yule Lads originate from Icelandic folklore. The Yule lads, or Yulemen, are a group of thirteen mischievous creatures that have largely taken the place of Santa Claus in the Icelandic celebration of Christmas. Their first major appearance can be traced back to the early thirties, when an Icelandic writer composed a short poem describing their role in the Christmas season. Since then they’ve gone through many different incarnations, from lovable gift-givers to annoying pests, and they’ve even been painted as bloodthirsty creatures that kidnap and eat children in the night. Mostly, though, the Yule Lads have become known for their playful nature. Each of the thirteen is known for playing a different, often quite weird, trick. Ketkrokur, for example, uses a long hook to steal meat, while Gluggagaegir spies into people’s windows in order to find things to steal in the night. Stekkjastaur, a personal favorite, is said to walk on peg legs and harass sheep. The Yule Lads aren’t just about playing strange pranks—they also give gifts to children. Accompanied by the Yuletide Cat, which is described as a hungry beast that is known to eat bad children, they place small gifts in the shoes of well-behaved kids in the thirteen nights leading up to Christmas Eve. Naughty children, meanwhile, are given potatoes. The Tomte legend can be found in Scandinavian countries like Norway, Finland, and Sweden. In their earliest incarnations, the Tomte (also known as Nisse) were said to be small, gnomish characters that kept watch over family farms. They were generally kind and looked out for people, but they had short fuses, and were quick to beat up or play tricks on those who weren’t good stewards of the farmland. Over time, and with the increasing influence of Christianity, the Tomte eventually became integrated into the more traditional celebration of Christmas. Their appearance changed, too, as they were given more human features and eventually took on a role more closely related to that of Santa Claus. Modern Tomte (now known variously as Jultomte, Julnisse, and Joulupukki) do still differ from Santa in many ways. Most notable is that they tend not to be fat, and even though they might drive a sleigh, it doesn’t fly. They don’t live in the North Pole, either. In fact, in some regions, children are told the character lives in the woods just outside their house. Also unique is that although the Tomte brings gifts to kids, he doesn’t sneak in the house through the chimney at night. Instead, a parent or relative will dress up like the character and bring the gifts to the kids in person. Literally meaning “the Christ Child,” Christkind is a holiday gift-giver associated with different parts of the world where Christianity is the main religion. He was popularized in the 1500s by Martin Luther, who hoped that a more religion-based holiday figure would help stamp out what he saw as the corruptible influence of St. Nicholas. Since he is supposed to literally be the baby Jesus, Christkind is usually depicted as a small, saintly child with blond hair and the wings of an angel. The influence of Christkind as the sole holiday figure has waned with the increasing popularity of Santa Claus, but it is still widely celebrated, especially in the more largely Catholic regions of South and Central America. Unlike many holiday gift-givers, the Christkind is never actually seen. Gifts are exchanged to honor the spirit of the Magi bringing gifts to the baby Jesus, but Christkind himself doesn’t ever make an appearance, and children are often told that he disappeared just moments for they arrived. Belsnickel is a legendary figure who accompanies Santa Claus in certain regions of Europe, as well in some small Dutch communities in Pennsylvania. Like the Krampus in Germany and Austria or La Pere Fouettard in France, the role of the Belsnickel is to be the main disciplinarian of Santa’s entourage. He’s usually depicted as a mountain man-style figure with fur covering his body, and he occasionally wears a mask with a long tongue. Unlike Santa, who was designed to be beloved by children, Belsnickel is generally a character to be feared, and in most regions he is employed as a sort of warning to coerce kids into being good. 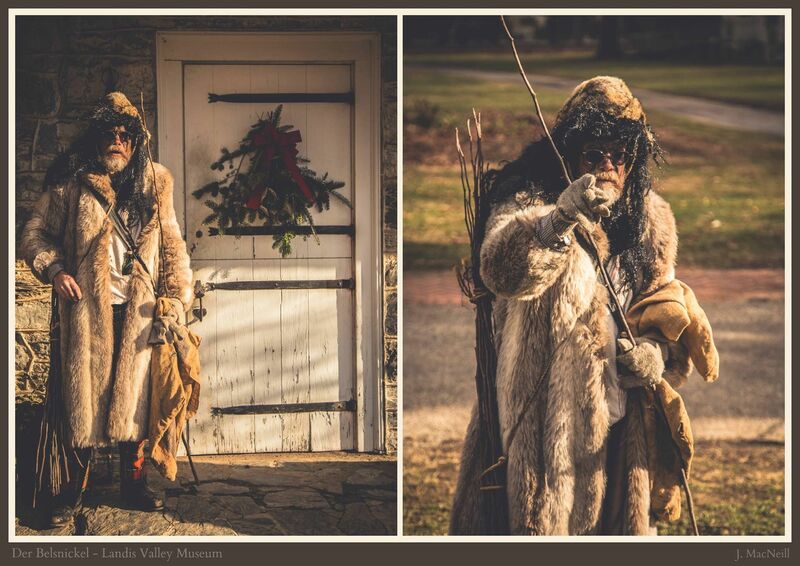 Although Belsnickel generally comes off as a negative figure, in some regions he is also known to give gifts. 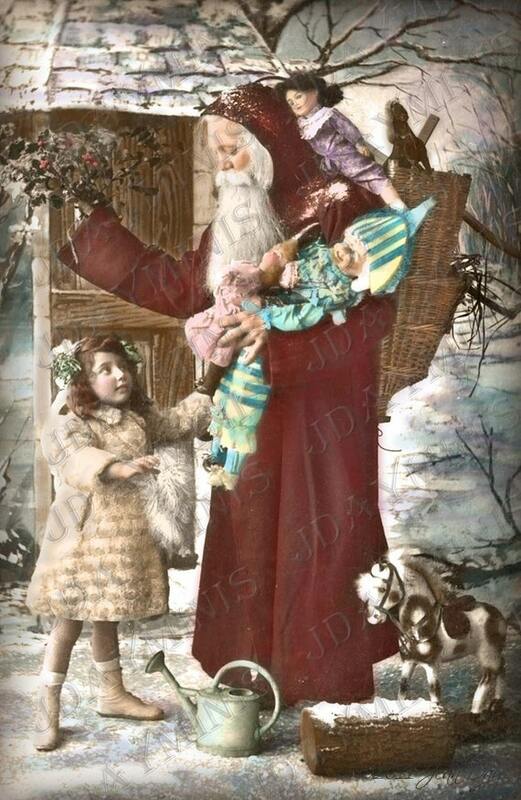 In Germany, for example, well-behaved kids are given candy and small gifts on Dec. 6, the feast day of St. Nicholas. Naughty children, on the other hand, are given coal or switches, and in some places they may even receive a visit from the Belsnickel himself, who will warn them that they should be on their best behavior. Papa Noel is one of the most popular incarnations of St. Nick, and Pere Noel from France is one of the most famous versions. He resembles Santa Claus in appearance, but instead of using reindeer he rides a single donkey called Gui, which means Mistletoe in French. Like many other countries, some regions of France also celebrate St. Nicholas’ day on December Fifth. For this holiday, along with the traditional St. Nick figure, the French also have a character called La Pere Fouettard (The Whipping Father). Like Belsnickel, he’s a figure who is supposed to be feared by naughty kids, and based on his back-story, it’s easy to see why. In the most popular version, it is said that in the 1100s La Pere Fouettard and his wife kidnapped and murdered three young men and then cooked them into a stew. After the victims were discovered and brought back to life by the benevolent St. Nicholas, La Pere Fouettard repented his evil deeds and vowed to serve as his helper. Like Sinterklaas and many other variations of Santa, Pere Noel places small gifts and candy in shoes left next to the fireplace. La Pere Fouettard, meanwhile, is a little less cheerful. He carries rusty chains and switches, and doles out floggings to children who misbehave. In some versions of the story, he gets even more brutal, and is said to cut out the tongues of kids who’ve been caught lying. Similar to Santa Claus in style but quite different in appearance, the Befana is a witch-like character who has become a big part of yuletide celebrations in Italy. Her back-story varies, but the most popular version describes her as being a kind woman who gave food and shelter to the three wise men while they were en route to visit the baby Jesus. Much like a traditional Halloween witch, the Befana is portrayed as an old hag who rides a broomstick, and she typically wears a black shawl and carries a bag of gifts. She supposedly does not like to be seen, and is said to whack any child who her spies on her with her broomstick—no doubt a clever way of keeping the kids in bed while parents arrange gifts in the night. 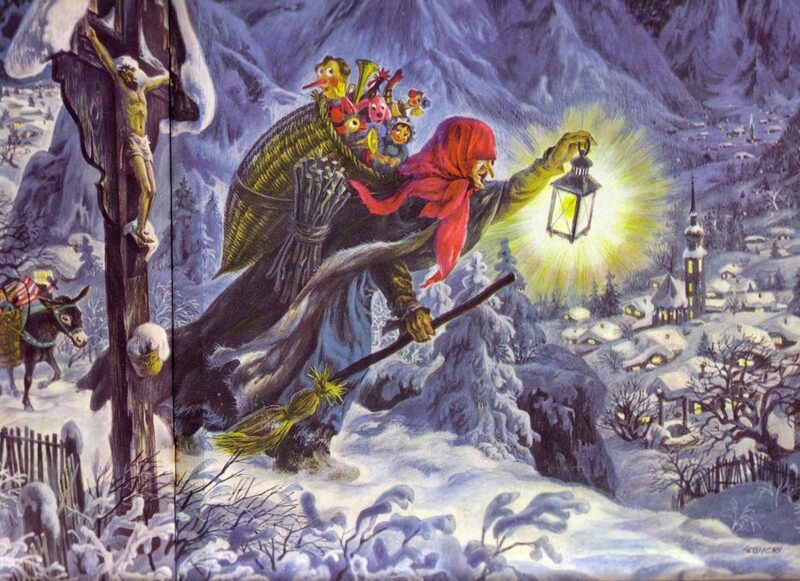 Like Santa Claus, La Befana supposedly climbs down the chimney to leave gifts for kids, and she also is known to leave behind a piece of coal or ash for those who have been naughty. As the legendary Befana was regarded as the best housekeeper in all of Italy, she also is known to sweep the floor around the chimney on her way out. In Alpine countries, Santa Claus is roughly the same jolly old gift-giver as he is in North America, with one key difference: he’s accompanied by a terrifying, bloodthirsty monster called the Krampus. With a name that derives from the German word for “claw,” Krampus serves as the resident heavy of Santa’s gang, dishing out beatings and other medieval-style punishments to naughty kids. The legend of the creature dates back hundreds of years, but the church stamped out the majority of its influence in the 1800s. Today, the creature is still a minor Christmas character in some parts of Bavaria and Austria, where “Krampus Day,” or “Krampustag,” is held on December 5. People dress up as the Krampus and parade through the city streets scaring people, and there are even some towns that hold festivals devoted to jokingly celebrating the history of the creature. As you can probably tell, gifts aren’t really the Krampus’s style. In traditional folklore, he was much more likely to provide misbehaving kids with a beating from a birch rod or, if they were lucky, a stern warning. In darker versions of the story, he was even said to kidnap the worst of a town’s children, stuff them inside a burlap sack, and toss them in the river. Literally translated as “Grandfather Frost,” Ded Moroz is the traditional holiday gift-giver of Slavic countries in Eastern Europe. Like Santa, Ded Moroz wears a flowing red costume and sports a white beard, but he doesn’t use reindeer or ride a sleigh. Instead, he drives a troika, which is a traditional Russian horse drawn sled. The most interesting aspect of Ded Moroz is his background. As the story goes, he was once an evil and vicious sorcerer who would kidnap children and demand presents as a ransom. Over time, he was reformed, and now he gives gifts to children in order to atone for his once-wicked ways. Also unique to the Ded Moroz legend is his granddaughter Snegurochka, “the Snow Maiden,” who is said to accompany him on his trips. 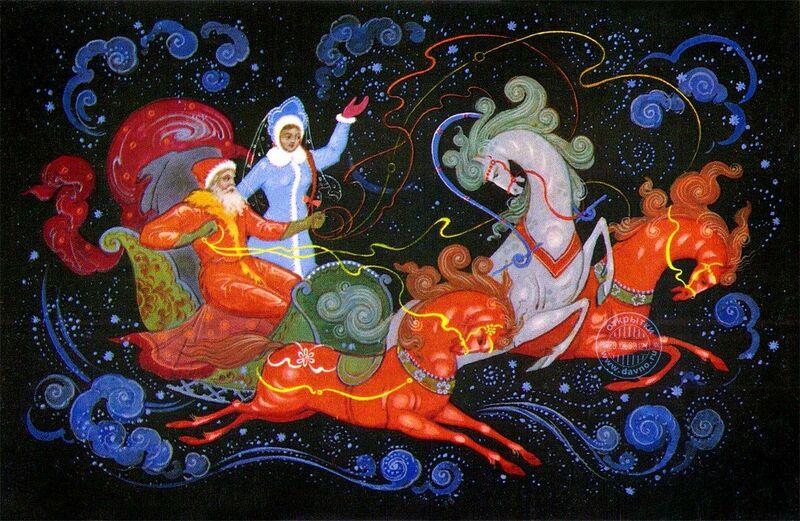 Ded Moroz typically arrives on New Year’s Eve or New Year’s Day. Like Santa, he brings gifts for children and places them under the New Year’s tree, although in some versions he will show up at parties and celebrations to give out gifts in person. Sinterklaas is the Dutch version of Santa Claus. With his traditional red costume, flowing white beard, and all-around jolly demeanor, he closely resembles the more famous North American Santa, and many have claimed that he is the biggest influence in the creation of the modern day Saint Nick. Unlike Santa, Sinterklaas comes to the Netherlands ever year in late November. He is said to arrive by steamboat from Spain, and after landing he is paraded through the city streets so that he can greet all the Dutch children. Sinterklaas doesn’t use elves, but is instead assisted by Black Peter, a little boy who helps him hand out presents. There are many versions of how Black Peter came to work with Sinterklaas, some of them quite controversial. In the earliest telling, he was Sinterklaas’s black servant boy or even his slave, but other versions state that he is a type of demon. Because of the racist overtones of the old Black Peter stories, in recent years his background has been rewritten, and he is now often described as being a chimney sweep. Unlike Santa, Sinterklaas brings children gifts on the fifth of December, a holiday designed to celebrate the historical figure of St. Nicholas. Children place their shoes by their fireplace, along with some carrots for Sinterklaas’s horse, and if they’ve been good, there will be candy and presents in the shoes come morning. Sinterklaas doesn’t leave the gifts himself; instead, Black Peter climbs down the chimney with presents for the good kids and coal or bags of salt for those who were naughty. In older versions of the legend, Black Peter would kidnap the worst of the children and take them away to Spain as punishment. Along with Sinterklaas, Father Christmas stands as the biggest influence in the creation of the more modern American Santa, and he is still the primary Christmas gift-giver in the holiday legends of several different countries. In his modern incarnation, Father Christmas is often indistinguishable from Santa Claus, but their origin stories are actually quite a bit different. Early versions of the character from the 1600s depict him as a merry old man clad in a green robe. At the time, he wasn’t seen as a gift-giver, but rather as the spirit of good tidings and the joy of the Christmas season. This incarnation was made famous by Charles Dickens in A Christmas Carol, who used the popular conception of Father Christmas as the model for his “Ghost of Christmas Present” character. With time, though, Father Christmas merged with Santa Claus and Sinterklaas into his more modern role as a bringer of gifts to children. The modern version of Father Christmas differs very little from Santa Claus in his gift-giving methods. Like Santa, he rides a sleigh pulled by a team of reindeer, and climbs down the chimney to leave behind gifts for nice children. Families often leave behind snacks for him and his reindeer, though these differ according to the country. His location and appearance differ as well. Some versions of the legend state that he wears a green suit instead of the more prevalent red, and he doesn’t always live in the North Pole. Some countries cite Greenland as the traditional home of Father Christmas, while others use the Lapland Province of Finland. sinterklaas is based on historical facts and santa claus is made up from that. xmas is the birth of christ and the xmas tree is abouth Fertility. You have some things messed up with Tomte (or tonttu here in Finland). Joulupukki is not tonttu, they work for him. Joulupukki is Santa. He lives in Korvatunturi, Finland. Tonttus act as spys and tell him, who's been nice. Joulupukki drives a sleigh, not the tonttus. Other wise nice article. Hyvää joulua from Finland! Thanks for clearing that up, Aralia. I have to say that the Tomte was the entry I had the hardest time finding reliable information on, but it was just too interesting to leave out! Sinterklaas is not a dutch version of Santa Claus. Sinterklaas is based on the historical story of a Christian Bishop working in Turkey and retiring to Spain. It is in no way related to, derived from, or a substitute of Santa Claus. Furthermore the entire story surrounding Sinterklaas, how he arrives, Black Pete, nothing has anything to do with Santa Claus. I'm aware of the background of Sinterklaas, but this list was written more in reference to the way kids see the characters rather than their exact historical backgrounds. I agree that I was a little unclear in saying he's the dutch version of Santa, but all I meant was that, like Santa, he serves as a gift-giving character of the holiday season. Still, I have to disagree that Sinterklaas has nothing to do with the modern Santa Claus. As far as I can tell, he's one of the biggest historical influences on the modern Santa character, and there are certainly some major similarities. I just wanted too mention this because people might forget the treu meaning of xmas. He was taken to the US by European immigrants (mostly Irish I believe). In Europe they say that when he’s not giving out presents he lives in Spain (though there is no actual historical refrence for this, we just seem to all accept this as true). In the US the south or Spain wasn’t a very place for him to stay, so they chose a more remote ‘home’. When they decided on the North Pole though he needed a thicker wardrobe to protect him from the snow and cold. I don’t know how the date of gift giving changed though. In Belgium and the Netherlands he visits homes on the 6th of December (the saint day/birthday of Saint Nicholas), for some reason Santa visits on Christmas. In Belgium there is no connection between Sinterklaas and Christmas. Right you are. The early Dutch immigrants in New Amsterdam — later called New York — celebrated Sinterklaas. In the morning of December 6, Yes SIX. (Sinterklaas’ birthday) a few presents were found in shoes and stockings around the fire place. A treat from Sinterklaas for the sweet children who had been busy singing St. Nic. songs… Gifts forwarded by Sint’s little helper black Peter who came through the chimney. In later years the date was set on Dec. 5 in the evening, which allowed more time to celebrate and unwrap the parcels. Also small humorous rhymes were incorporated in some parcels. Mentioning the good and or bad behaviour from the passed year. Rhymes had to be read aloud. English speaking immigrants welcomed this and incorporated this in their Christmas feast. Sinterklaas, Sainteklaas, Santa Claus was born. He immigrated back to Europe as Santa Claus. So Sint Nicholas (Sinterklaas is NOT at all a Dutch version of Santa Claus at all as so many people want us to believe. I really enjoyed this list. I think if someone like the Krampus was involved in the US watered down version of Christmas more people would be inclined to like it. As it is Christmas is just overrated version of BUY BUY BUY! Annoying as hell. I like the different versions of winter guys. It all seems to revolve around getting children to behave. I wonder if it has to do with the nights being longer and the sun not being around hardly at all. Getting threatened with all sorts of things will make you want to behave atleast for a little while will it not? It is my belief that the celebrations we have for this time of year started off for the Winter Solstice. Then after banning the pagan celebrations didn't work, the Catholic Church decided to celebrated Jesus's birthday on Dec. 25. The exact same day of Winter Solstice. Clever hum? So Christmas is a Pagan Holiday! Celebrate everyone! No one really is for certain when Jesus was born. in spain Santa doesn't bring the presents..
Sinterklaas comes on the 6th of december. And his grave is in Turkey. But we tell the children he comes from Spain with oranges and tangerines. It's a very nice holiday. Belsnickel!!! and I always thought that was something my dad made up to scare us…. I guess he's real and kids should be afraid… very afraid…. I'm from Poland. Well, it's not like I do not know who Ded Moroz is, but we don't celebrate Grandfather Frost. He is popular only in "mother Russia" and probably Ukraine. And Serbia, Bosnia, Macedonia, Poland, aren't former Soviet republics, what is suggested. We're postcommunistic but not soviet. The only one Santa we believe in is the traditional one from Laponia, so it's kinda mistake in the article. However it's great, just like all from this website. Sinterklaas and Black Peter? That's a pretty funny way to transform "zwarte piet" in the name "Black Peter". Also, where's Mister Frost from Russia? I’ve uploaded a few days ago an animated film entitled “Christmas” on YouTube, which fits nicely with your website. He told a child just like the Christmas mail reaches the North Pole and processed. Moreover, it is shown how are the gifts. In this clip I’ve put more than 1,600 hours of work, but the results speak for themselves. As a special feature I would like to mention that this film is also available as a 3D version. I would be delighted if they would recommend this film or paste it into your site. Ahh, Ded Moroz, it’s been a long time since I lived in Russia, good times, good times. Might I add, that “Sinterklaas” is a real historical characater, didn’t know when he lived, but I do know that he was real. Don’t forget that the modern version of Santa Claus was created by the Coca Cola company in the 20th century, making an amalgam of previous versions. @dun dun dun: I’m pretty sure that Grandfather Frost was repackaged as a Russo-Finnish movie in the 1960s, used in the MST3K episode titled “Jack Frost”.